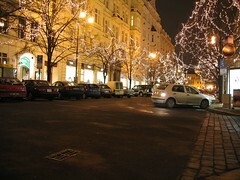 The tree lined Pařížská Street is located near Old Town Square, close to the Vltava River and the Jewish quarter. It is lined with beautiful, elegant buildings, similar to those found in Paris and surrounded by many historical and cultural buildings. It is an exclusive shopping precinct filled with luxurious designer retail stores and most of the items are priced to match. The street is also home to up-market hotels and restaurants including Barock Restaurant with its movie star and film theme. International companies such as the retailers Louis Vuitton, Cartier, Prada, Hugo Boss and a Christian Dior boutique all have premises along this street. There is also a good selection of Czech porcelain and Bohemian glass and crystal from stores such as Karlovarsky Porcelain and Celetna. Practical, more everyday items are also sold and the prestigious shops are interspersed with stores such as Tesco, Marks & Spencer and Bila Labut. A large Debenhams store based on the same principles of its parent company in Britain is also here and there is also a range of antique shops. A visit to Pařížská Street will certainly be memorable, not necessarily for the item you may or may not buy, but for the experience of just looking and taking in the wonderful ambience of the area. Be the first to write a review about the Pařížská Street! See below for more information. Have you already visited the Pařížská Street? If so, let everyone know what you thought about it by writing a review! No registration necessary. Just click here to start writing!